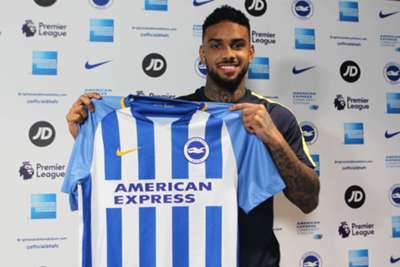 Brighton and Hove Albion have parted with a club-record fee reported to be in the region of £16million to sign PSV striker Jurgen Locadia. The forward has penned a deal to 2022 at the Amex Stadium, as Chris Hughton looks to add goals in the Seagulls' attempts to retain their Premier League status. Brighton are 16th in the table, three points above the drop zone, but only rock-bottom Swansea City have scored fewer than their 17 goals this term. Locadia arrives on the south coast with nine goals to his name in 16 Eredivisie outings this season. Hughton told the club's official website: "We are delighted to have signed Jurgen, and pleased to welcome him to the club. "He is a player we have been aware of for some time, and it's been no secret we have wanted to add a striker of his type. "He is a strong, powerful and quick centre-forward, with a real eye for goal and will increase our attacking options in the second half of the season. "Jurgen already has a prolific goal record with PSV in the Dutch top division, and it is one we hope he can continue here with us in the Premier League."